If you're custom building your holiday to Kathmandu and / or anywhere else in Nepal there are literally hundreds of places to stay ranging from small Guest Houses to up-market Hotels. As a lot of the holiday trade there is from Trekkers, the most popular are usually the 'one or two day' stay over Establishments. 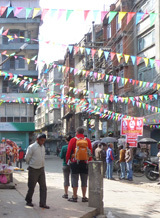 The most popular area for Tourists is Thamel where you find numurous Guest Houses and Hotels in almost all of the narrow Streets. Most Hotels are slightly set off and not so clearly seen from the Roads. Prices can vary a lot, you can pay as little as £6 per night up to £40 a night including Breakfast. On average, depending upon the time of the year, expect to pay around £20 - £25 for a decent place. During the busiest months (Spring and late Autumn) most places are booked up, so if pheasible book before you go. This can be done direct or through Tripadvisor , Expedia UK or AsiaRooms.com. It's a good idea to read all the reviews carefully, people who visit Kathmandu like to review! Most larger places have either their own Travel Service Information and guide you in the right direction for booking trips and taxi's etc. Some have their own Taxi's and some will do all the bookings of any flights or Hotels in other areas as a free service. If you want your holiday to be hassle free, it's a good idea to book somewhere with these facilities. 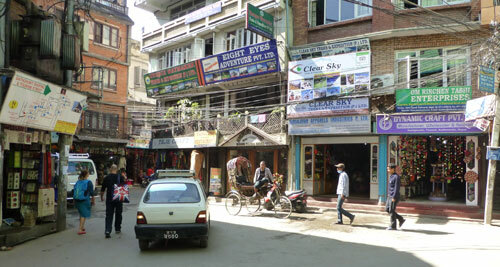 The higher end of the scale Hotels price wise are found more on the edge or outskirts of Kathmandu. Bear in mind that Thamel is a very busy and often noisy place although most Bars with music close before midnight.